As a pipe insulation company servicing the states of Rhode Island ( RI ), Massachusetts ( MA ), and Connecticut ( CT ), Anchor knows how important insulation is to most thermal systems. It is used to prevent heat loss and gain from pipes. By preventing this loss and gain to the temperature in the pipes, it saves energy and improves effectiveness of the thermal systems. 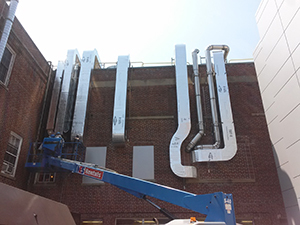 As a duct insulation company with offices in Rhode Island ( RI ), Massachusetts ( MA ), and Connecticut ( CT ), Anchor will help you conserve energy costs by insulating your duct work. Uninsulated or poorly insulated ducts in unconditioned spaces can lose 10%-30% of the energy used to heat and cool the space through conduction. Heating and cooling equipment then has to compensate for the heat loss and gain by conditioning additional air, which in turn raises energy bills. In addition, when ducts lose heat through conduction, rooms served by long duct runs can experience cold blow during the winter because they usually have lower heating-supply temperatures. You can greatly improve both the thermal and acoustic performance of your existing metal ducts by wrapping them with duct insulation (also known as duct wrap). When properly wrapped and sealed with the recommended tape, your ducts will deliver air at a consistent temperature from room to room and save energy by reducing the energy lost from bare metal surfaces. Choosing to insulate your ducts is a great option. The energy prices on the rise by insulating your ducts in the end it will save you money. It will also put less strain on your heating and cooling systems meaning the machines will not have to work as hard to heat and cool a room. Contact us today and see how our duct insulation solution is right for you. 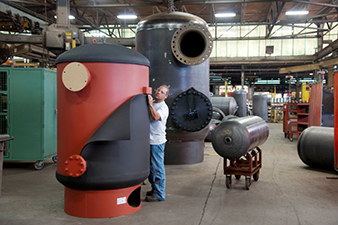 Anchor is a tank insulation company with over three decades of experience insulating tanks and vessels of all sizes and shapes. We provide knowledgeable and innovative solutions for your plant needs. From huge to small, indoor or outdoor, horizontal or vertical, Anchor has the design and installation experience to ensure the most efficient and long lasting insulation system for your application. 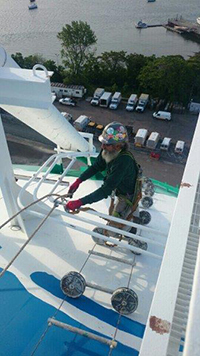 Our crews can install horizontal panel systems or vertical standing seam systems for a wide range of temperature requirements. We also gladly work with our customers to make sure the results are pleasing in appearance, fitting well into the landscape. Types of Insulation: isocyanurate foam, foam glas, calcium silicate, aerogel, armaflex, polystyrene, fiberglass, perlite, removable insulation blankets, mineral wool, Spray foam. We provide free estimates, thoroughly consulting with our customer to understand all requirements including tank dimensions, temperature requirements, wind load, fastening, seams, flashing details. We execute the project with a high level of safety, craftsmanship and customer service, ensuring superior, long lasting results. For years following, our tank insulation systems generate savings in energy costs. We look forward to the opportunity to prove we are your best insulation solution. Contact us for all of your Pipe insulation, duct insulation and tank insulation projects.